Down here in the southern hemisphere, we tend to come a very distant fourth, fifth or last to other parts of the world when it comes to spring and summer knitting. I should clarify at this point that I mean that we often knit a lot over the warmer months and can even be found sweltering under a half-knitted blanket with the fan or air-con directed straight at us (anyone else done that?!) 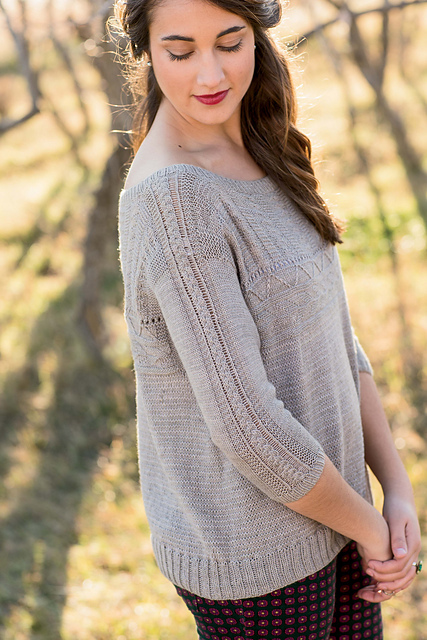 but we very rarely make lightweight knits to wear in the hot months. Perhaps that’s because we’ve got out of the habit of knitting with fine yarns or because we don’t much like how cotton can be hard on our hands. It also seems like summer knits aren’t really part of our fashion culture in the way they are in Europe, Scandinavia and parts of Asia (although local labels like Gorman and Obus are certainly bringing them back into our wardrobes). But, here at Sunspun, we’re determined to do our bit in turning that around, at least in our neighbourhood! We’re bringing in some very beautiful lightweight yarns from Shibui, Isager and Rowan (more on those as they arrive) that will truly be comfortable to wear on a hot summer day, and have already started carrying some summer-weight yarns that defy the stereotypes, such as Rowan Softknit Cotton and Truesilk which, because of their chain or crepe construction, have a good bit of spring and bounce and so are easy to knit. 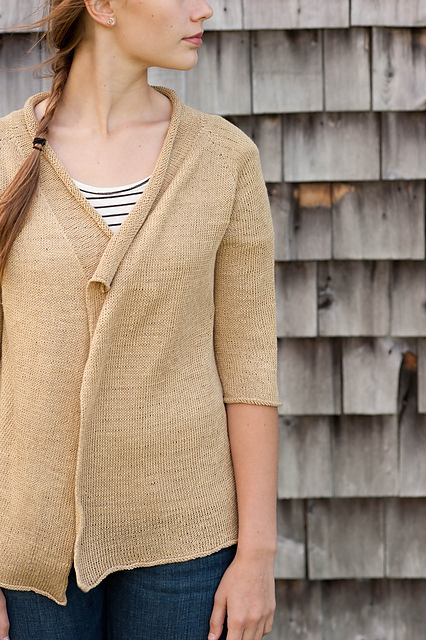 Perkins Cove Pullover by Carrie Bostick Hoge for Quince and Co.
Brise Cardigan by Hannah Fettig for Quince and Co.
Saco Stripes by Pam Allen for Quince and Co. In the spirit of the challenge of bringing summer knitting to the masses, we’re having an informal knit-a-long! 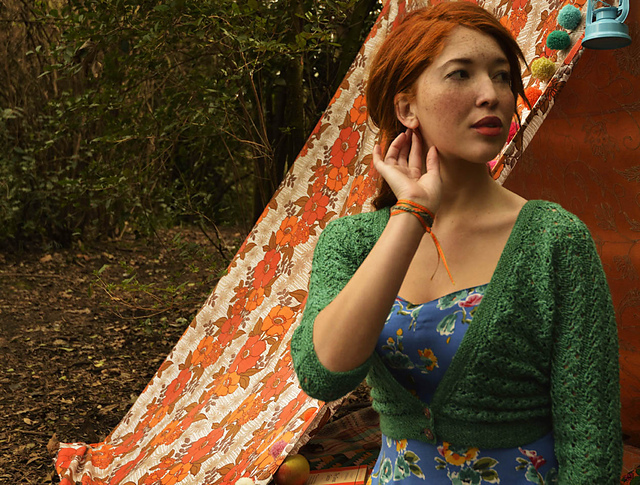 Kylie and Jules have just started working on this beautiful little cardigan and we’d love you to join us if you’d keen! The pattern is from one of 2013’s issues of Pompom Quarterly and is available on Ravelry or from Pompom. 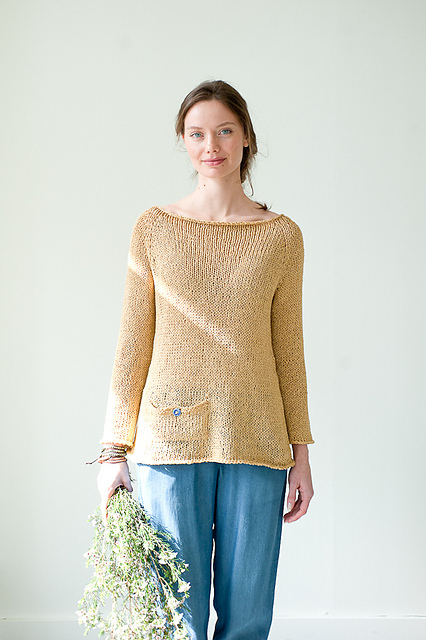 It is knitted in 4ply wool yarn but could easily be worked in cotton, bamboo or linen…. We hope you’ve found some inspiration here and look forward to seeing where you take your warm weather knitting- we’d love to see photos of any summer knits so do follow and tag us on Instagram so we can watch your progress! Categories: Knitting, New, Yarns | Tags: Kim Hargreaves, Pompom Quarterly, Quince and Co., Rowan, summer knitting, Sunspun, warm weather knitting | Permalink.